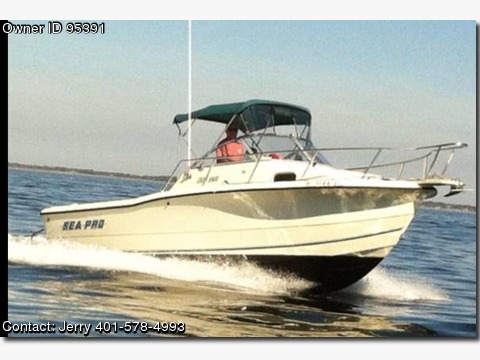 Call Boat owner Jerry 401-578-4993.2nd owner. THIS IA A VERY CLEAN PERFECT RUNNING BOAT NEEDS NOTHING. JUST HAD THE CARBS REBUILT WITH ALL NEW FUEL LINES FROM TANK TO THE CARBS. BOAT RUNS LIKE NEW WITH 386 HOURS ON THE 1999 225 JOHNSON, NEW SIMRAD RADAR AND SHIP TO SHORE LAST SEASON NOT A YEAR OLD YET. GREAT FAMILY OR FISH BOAT YOU CAN FISH WITH THE LIVE WELL AND SALT WATER WASH DOWN OR TAKE THE FAMILY OUT FOR THE DAY OR OVER NIGHT WITH SLEEPING BELOW WITH A HEAD AND FRESH WATER SINK. BOAT HAS FULL CANVAS OR JUST USE THE MOORING COVER. THE TRAILER IS A 1999 VENTURE.